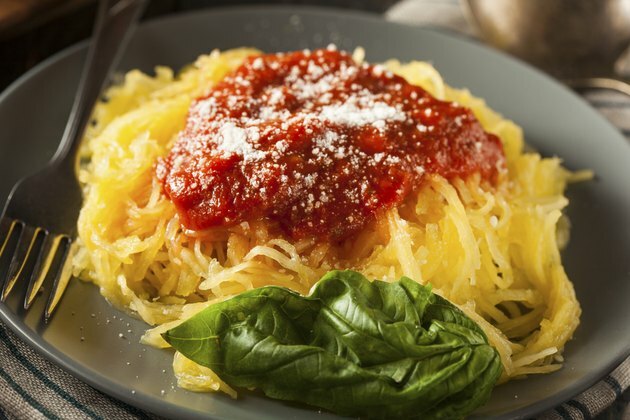 The fibrous flesh of spaghetti squash resembles long noodles after cooking and shredding. Although the squash noodles differ in flavor from traditional flour-based pasta noodles, you can use them in much the same way as pasta. The squash has a mild, nutty flavor that complements lighter pasta sauces, making it a healthful low-carbohydrate replacement for spaghetti in your favorite dishes. Use the squash as the focal point of a light meal or as pasta-like side dish. Cut a washed spaghetti squash in half lengthwise. Scoop the seeds out of the center. Lay the squash cut side down on a baking sheet. Poke the rind all over with the tines of a fork. Bake in a preheated 350 degree Fahrenheit oven for 45 to 60 minutes, or until the flesh is tender enough to pierce with a fork. Flip the cooled squash halves over to reveal the flesh. Scrape a fork down the length of each squash half, separating the spaghetti-like strands from the rind. Toss the squash strands in a tomato-based pasta sauce to create a meal similar to spaghetti. Alternatively, coat the strands in melted butter with a sprinkling of Parmesan cheese and crushed pepper. Most pasta sauces, except heavy cream sauces, complement the squash noodles well. Remove only the spaghetti strands from the squash, not the fleshy portions between the strands. These fleshy portions, while edible, have a stronger flavor that doesn't complement tomato-based pasta sauces well. You can boil instead of baking the squash to loosen the strands, if desired. Boil a whole, uncut squash for 30 to 45 minutes. How Many Calories Are Burned Playing Squash?